“I used to go out for fro-yo like five times a week,” said a co-worker at Grub Street HQ recently, with a sigh. “But I can’t remember the last time I visited 16 Handles.” It wasn’t the first time I’d heard this kind of comment recently. A friend who runs a bar in midtown used to stop in for fro-yo a few times a week, but his appetite has cooled. “It’s been a while, even though I have enough loyalty points to buy a Maybach.” The toppings bars in the shops are still full of colorful gummy bears and rosy diced strawberries, but New York’s fro-yo boom has hit dark times. 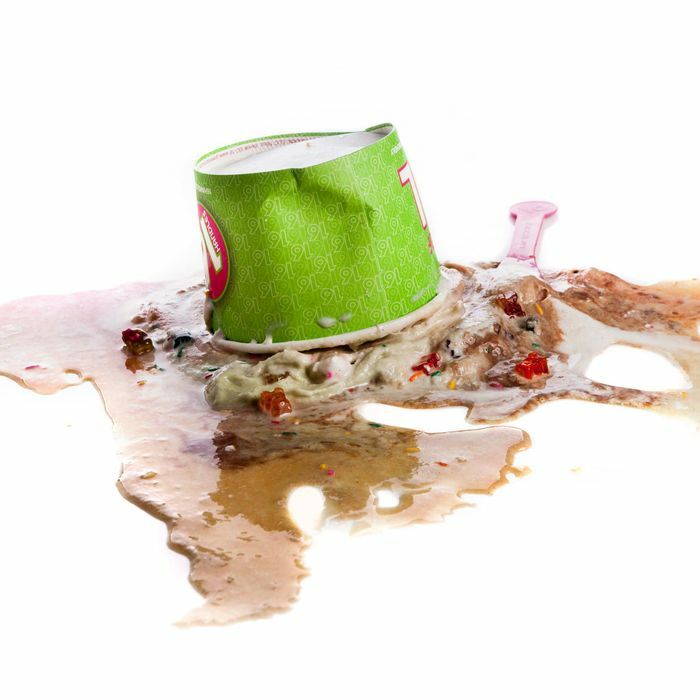 The slow decline of New York’s recent frozen-yogurt dessert-scape can be seen more acutely in the East Village, long a haven for frogurt shops. Twist on Avenue A opened last fall, then promptly disappeared; the unrelated shop Twister on Second Avenue closed in March, lasting just over half a year. The festive-sounding Yogurt Crazy was first announced for Third Avenue in 2012 but instead, a notice from NYU — its landlord — appeared taped to the storefront last year demanding $37,134.87 in back rent. Over in Brooklyn, Forever Yogurt signed a lease near Barclays Center, but that ended in eviction papers and a claim of $12,000 in unpaid rent. Independent shops aren’t suffering alone. Big Frogurt is having similar trouble: Pinkberry Chelsea, at Eighth Avenue, closed recently. Pinkberry Gramercy and Pinkberry Columbus Avenue were filled with customers this time last year, but have since gone dark. The chain’s once-mighty 177 Bleecker Street location, which had lines out the door, closed without any fanfare in 2012, three years after the Red Mango across the street had done the same. Then there’s the West Village. Chicago chain Forever Yogurt, which was supposed to debut in the hallowed old Bleecker Bob’s, has quietly canceled its plans. Perhaps it was put off by the rent, which is rumored to have been between $15,000 and $20,000 a month, a tall order even for a chain that boldly proclaimed it was scouting the Lower East Side, Upper East Side, Upper West Side, and Brooklyn. New York hit a natural saturation point. The shops sell the exact same product, which makes it impossible to stand out. That yogurt mix is just one reason these shops all feel the same. Hardly anyone makes much of the fact that almost every business uses the same commercial mixes, produced by a company called YoCream, a division of Dannon. But if all these shops look the same, and they all buy the same core ingredient, it becomes increasingly difficult to stand out from the crowd. Shops try to tout the hiring of a “New York City-trained pastry chef,” or attempt to make customers think that flavors like “Birthday Cupcake Batter” are somehow substantially different than a competitor’s “Yellow Cake Batter” flavor, but it’s not enough to get new customers in the door. Yogurt shops require increasingly expensive real estate. “I don’t know how many more frozen yogurt places we can handle, but every time I think I’m done, you see another one,” says Julian Hitchcock, a commercial real estate broker. The big problem is that the yogurt chains operate stores more like a retail business than a traditional restaurant, meaning it’s important to them to have prime spaces on stretches with lots of foot traffic (instead of tucked into a former garage in Bushwick, for example). According to Hitchcock, that means they all take “incredibly good, and incredibly expensive spaces,” which aren’t cheap. “We used to joke about starting a side business that would just be me talking to the frozen yogurt chains as they would inevitably go out of business, because there’s just too many.” Hitchcock suggests that what’s happening now is a natural course correction. Unsurprisingly, some shops are now offering big sales to compensate for the lack of demand from customers. But at the newest Red Mango location, an ongoing glut of deep discounts — East Village residents and NYU students get 10 percent off by presenting valid I.D. ; cups are 20 percent off from noon until 5 p.m.; everything is 25 percent off from 5 to 7 p.m.; etc. — can also affect a sort of anti-charm. Green juice replaced yogurt as the city’s premier no-guilt expenditure. Tellingly, fro-yo’s most adaptive strategy seems to be to try to steal some mojo away from the sector that’s done the most to displace its novelty, the green juice business. Red Mango has begun to experiment with kale and drinks with names like “Cool Pineapple Zen,” and all new locations will get a juice bar. It doesn’t help that juice bars have even begun targeting kids (who might otherwise prefer strawberry-topped fro-yo to a kale smoothie). Last month, the two locations of the fashion-model-friendly Melvin’s Juice Box even introduced “Melvin’s Junior” menu, consisting of 100 percent organic, made-to-order drinks. The “powerful antioxidants and Vitamin C” in the “Orange Pop,” for example, “go under the radar with a citrus kick from oranges and pineapples.” No wonder Melvin’s will open its second location, in the East Village, next week.